Reel Talk Online: First Look: "Eat, Pray, Love"
First Look: "Eat, Pray, Love"
I'll admit it--I kinda hated Elizabeth Gilbert's pretentious true-story account of how she "lost" everything, only to find herself again in her 2007 book Eat, Pray, Love. But when I heard a movie was coming out based on it, I actually got kinda interested. And, I thought casting Julia Roberts as an exec who turns her back on corporate life, her husband to travel the world a perfect fit. In a nutshell, the story follows Gilbert's semi nervous breakdown which only leads her to regain her inner greatness to discover the same in many parts of the world including India, Italy and Indonesia. Through food, travels, men and spirituality, Gilbert rediscovers what's been lost for the last several years of her life--herself. 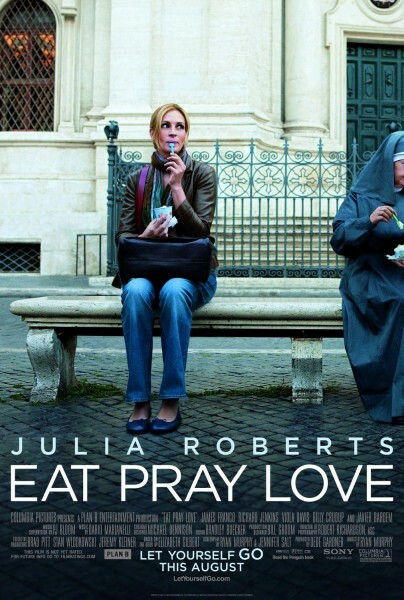 Eat, Pray, Love, co-starring Javier Bardem, James Franco, Billy Crudup and Viola Davis, hits theaters August 16. Check out the trailer below. Oh wow! Thanks for posting this trailer Candice. It really inspired me! I want to see this movie now! I was given the book years ago and haven't read it. So I look forward eagerly to the movie. Thanks again Candice, this post made my day! This looks like a great movie, thanks for sharing!